I love the Figure app, not so much for learning but as a music lover, I find it a great little App for playing with sounds and music and generating ideas. 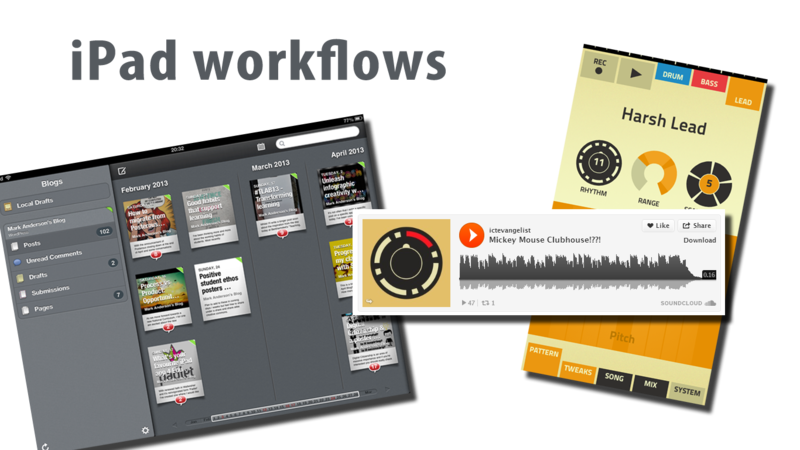 I brought up an excellent screencast I had recently seen by Julian Coultas (@digitalroadtrip) on workflow between Figure, Garageband (£2.99) and Bossjock Studio (£6.99). The conversation then moved on to another great app I came across recently called ‘Posts‘ because whilst a really good iPad WordPress/Blogger blogging tool many people had avoided it due to its £6.99 price tag – it’s now FREE! Joe asked the question; “can you embed stuff on the pages?”, because the editor allows you to easily access both the HTML and the rich text front end. I didn’t know. So we tried and we blogged the original post you can see below that this post has become with the successfully embedded Soundcloud / Mickey Mouse track. It’s great! Moving things from one App to the other is getting increasingly more easy on the iPad and the winners are the users and in our case, very thankfully, the students and their learning. I’d like to take this opportunity to thank Joe for a great night last night too. As someone who knows the odd App or two, it is always refreshing to get a complete whooping when it comes to great App ideas. Joe really knows his stuff and we had a cracking, albeit late o’clock by the time we packed up, night. Thanks Joe! Let’s see if this works!? A very interesting post, Mark. Mastering the issue of workflow is one of the keys to making iPads and iPods viable as tools for learning in the classroom. It’s great that you are sharing your success stories with this issue in the disciplines of music and audio – not my specialism, i have to admit. Thanks also for the tip about the ‘Posts’ iOS app. It’s really brilliant and easy to use. I have downloaded the Posts app and set up a new blog on blogger, as I already have another blog there, but when I try to add this blog Posts doesn’t recognise it. It gives me an error message saying “Unable to detect the type of blog”. My blog does not have a user name, so I just entered the email adress connected with my google account- maybe this is the problem, but I can’t see an option on blogger to create a username. Any advice? Apologies Hilary. I use WordPress rather than Blogger. I suggest having a look at the developer’s website: http://picodev.com/postsapp/ and getting in touch as it supposed to support Blogger blogs.